"They talk of the dignity of work. The dignity is in leisure." A few weeks ago, one of us on the Leyendecker team came across this article called "What successful people know about weekends." What do successful people know about weekends, according to this article? 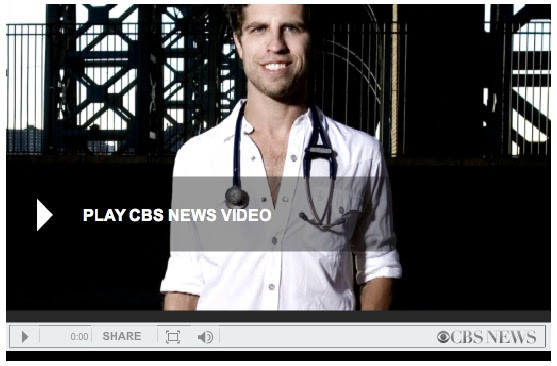 In short: How to use them to rejuvenate. They don't work on weekends. They don't get bogged down in chores or to do lists. They unplug and have some fun. We at L&A are finding ourselves in an extended weekend frame of mind. A vacation frame of mind. An August frame of mind. In the dog days of summer, these next few weeks are, for many, the last chance to take it a bit easier, take a break, detach a little before the pace quickens come fall. And we are because there's plenty of research that suggests taking breaks makes us more productive. In an homage to taking it easy, this month's TLV will focus on the benefits of knowing how to take a step back, take breaks and have fun, so that we can - and this is the ultimate point - feel rejuvenated enough during the work week to operate at our highest level of productivity. Work hard, relax hard, if you will. And because we at L&A want to practice what we preach, in this month's shortened TLV, we are also going to do our best to provide material to help you take a break. Read on for a random smattering of things we've come across that we find fascinating, fun and good fodder for a pause from the workday. We hope you have had a nice summer. Enjoy its final weeks before you gear up for a productive, successful and prosperous end to 2012.
when there's a repair job to be done around the house." Hosting a grown-up Halloween costume party a couple of years ago taught me a lesson. All those adults in costume just went wacky crazy giddy goofy. Their inner child didn't just peak out, it bursted out in full color. Certainly the hangovers after this event kept folks down a bit longer than usual, but maybe having a hangover every once in a while is a good thing. Too many people today are sitting on the edge of their seat worried about the coming election, our overall economic challenges, what's going to happen to our children and grandchildren, and how might we even cope if this darn economy doesn't turn itself around soon. Well, maybe we should just toss our arms in the air and say, Who gives a you know what? What's it all about, this worrying and arguing and postulating? Life will go on. There's no economic Armageddon, there's just change, as has always been the case. Maybe the right strategy for today is to work really hard at embracing our inner slacker. Or maybe not. Or maybe just now and then. He he haw haw...Have a great end of summer! In the spirit of taking it easy as summer wanes, instead of an L&A-built chart this month, we're linking to work someone else has done! 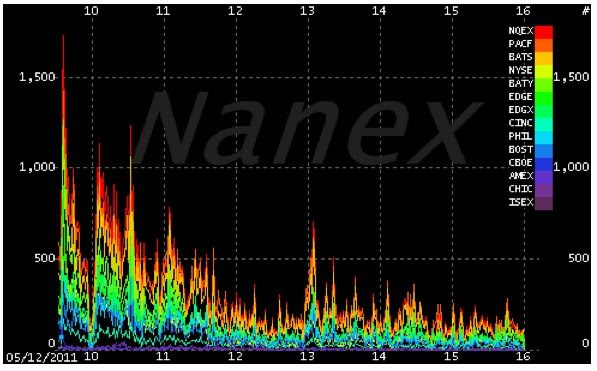 But for a good reason - this fascinating animated GIF shows that since 2007, high frequency trades in the stock market have moved from virtually nonexistent to dominant. The video starts off slow, but stick with it to see the dramatic, eye-popping jump. What does this mean for the individual investor? "All intellectual improvement arises from leisure." "...weekends are actually the secret weapon of workplace success. The most successful people know that to be truly productive, you need to hit Monday refreshed, relaxed and ready to go." How then can we avoid succumbing to that do to list, which seems always to grow, never to shrink? Or have weekends that feel like nothing more than days spent shuttling the kids around? Make lists of fun things you want to do, make a plan, then clear a few hours to do nothing but let the mind wander, to find calm before Monday comes. More and more research is showing that the fewer breaks we take, the less productive we become. (Not to mention the research that shows how detrimental sitting all day can be to our health...) A Mayo Clinic professor points out that the thought process is not meant to be continuous, but rather one that benefits from breaks and gaps. And in his new book,Imagine: How Creativity Works, author Jonah Lehrer discusses how moments of inspiration are most likely to strike when we're not trying to force them. In other words, imagination flourishes when we take breaks, step back. Are you convinced yet that working nonstop can be really unproductive? Follow the link for ideas for how to goof off productively on the job. For many of us, the mere word "procrastination" conjures memories of countless arguments between parents and children about just starting the homework already. This lifelong procrastinator believes that the word has gotten a bad rap. He prefers to refer to procrastination as "delay management." Using examples like the world's best and fastest tennis players, he argues that what sets them apart is not their speed, but their ability to slow down and procrastinate swinging until the last possible moment. Evidence has shown that slowing down high frequency trades has made them more successful. The secret? Putting off an action or decision until the last possible moment to maximize data gathering and preparation so that the most informed decision can then be made. The first suggestion in this article: Create more time by working fewer hours. We're listening...Go on. This list offers nice tools for bringing more meaning to your work as a way to infuse some energy into responsibilities. Among other ideas, it also stresses avoiding long work hours, which almost always put a big damper on productivity, as well as consciously making the effort to wind down and relax after each day. Turns out, only 2% of the population can actually increase productivity by multitasking. The rest of us are not only really bad at multitasking, we're suffering for it. Apparently multitasking is so taxing for the brain, it can lower our IQs! It can also cause us to lose 2.1 hours of productive work time per day. 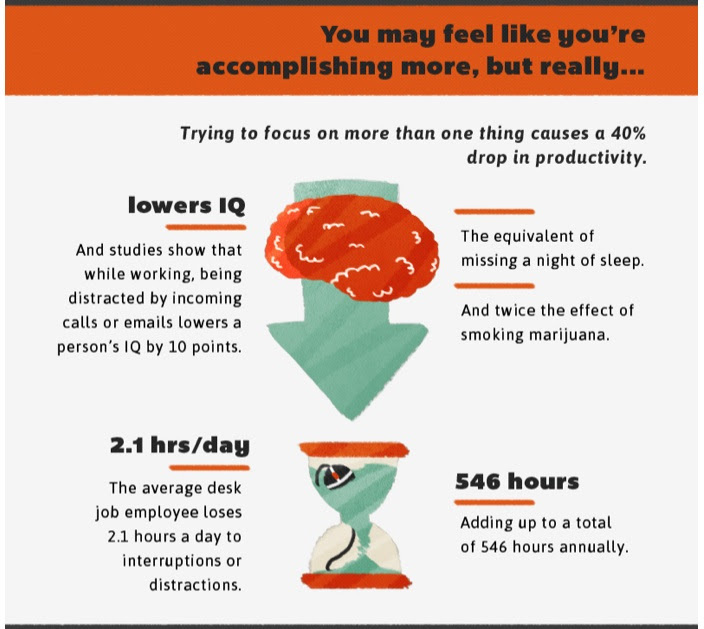 Follow the link for the full infographic on the perils of multitasking. and at present very few people have reached this level." Houstonians have known for some time they reside in the city that is, these days, ever more perceived as the economic heartbeat of the country. Using a rubric that includes things like non-chain restaurants and bars, diversity, median age, as well as healthy economic indicators, it's also finally getting its proper due as a "cool" city. The New Yorker links to five of the most viewed, compelling and inspiring TED Talks ever given. 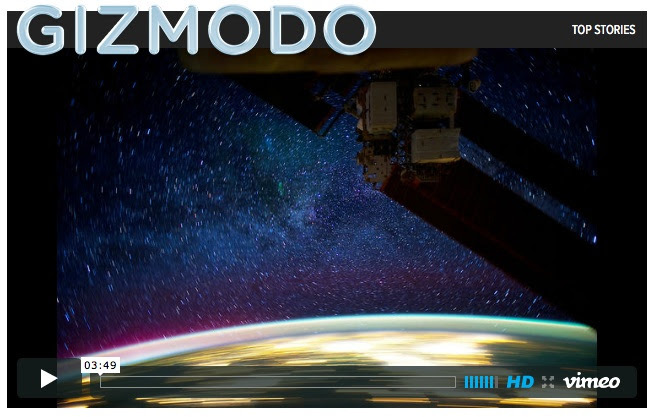 This time-lapse video of Earth is so stunning it seems fake. But it's real and it's jaw-dropping. This is The Internet Map. "Like any other map, The Internet map is a scheme displaying objects' relative position; but unlike real maps (e.g. the map of the Earth) or virtual maps (e.g. the map of Mordor), the objects shown on it are not aligned on a surface. 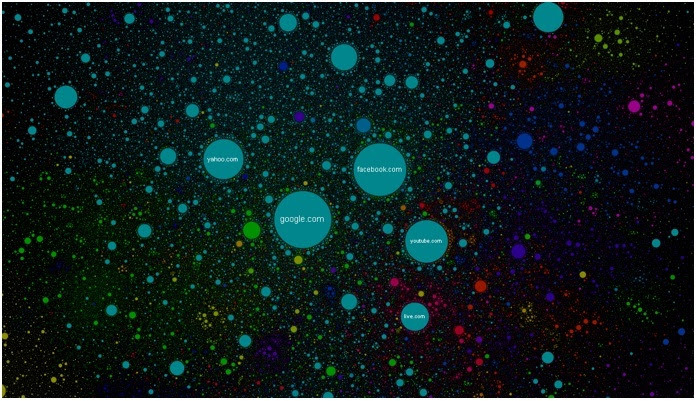 Mathematically speaking, The Internet map is a bi-dimensional presentation of links between websites on the Internet. Every site is a circle on the map, and its size is determined by website traffic, the larger the amount of traffic, the bigger the circle. Users' switching between websites forms links, and the stronger the link, the closer the websites tend to arrange themselves to each other." 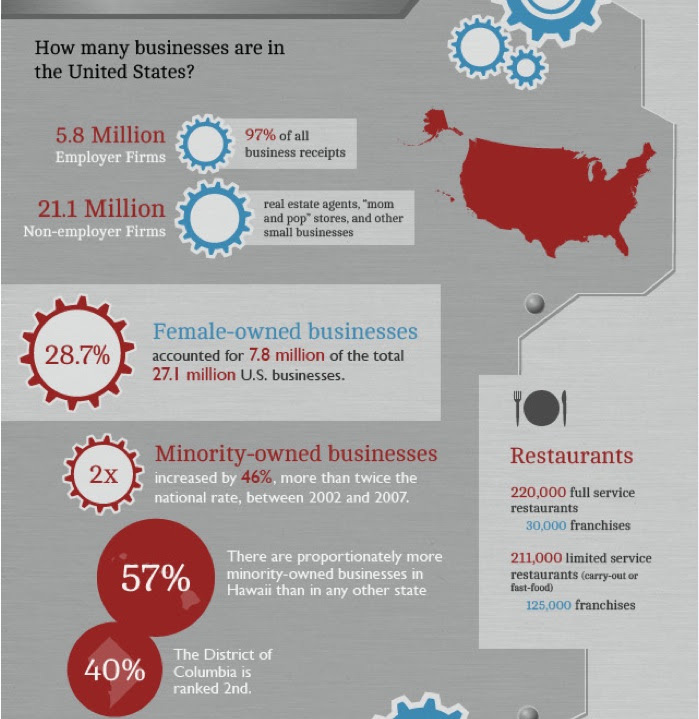 This cool infographic (the image below is only a snippet) breaks down the massive U.S. economy into just a few images, chock full of interesting figures and statistics about the nuts and bolts of the world's largest economy. Follow the link for the full infographic. "The more we do, the more we can do; the more busy we are, the more leisure we have."